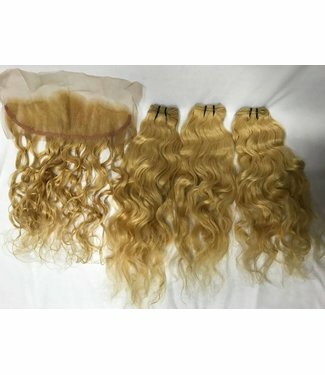 Raw Indian Blonde Frontal 13"x4"
What Frontal? Murdered these Golden Blonde Frontals. 13”x4” lace base with 18” hair length. Used Blonde Me on these Raw Indian Frontals to match their bundles. Raw Indian Wavy Curls are soft & don't shed much at all. Custom Blonde Virgin Hair at its Best! Raw Indian Blonde Closure 4"x4"
Yasssssss! Want one of these Blonde Me Closures? 4”x4” Lace Closures with 16 inches of our Raw Indian Wavy Curl. Ask your stylists to tone it more if you want but we’ll rock it as-is in this Golden Blonde look. These Natural Waves & Curls don’t fall out.